This 38 page presentation/short trading course is packed with valuable information about the E-Minis, from basic product information to examples of e-mini futures trading. Click the image above to download E-Mini Futures Trading 101 in PDF format. You can go to Commoditiesbrokers.com for more information about commodities brokers. 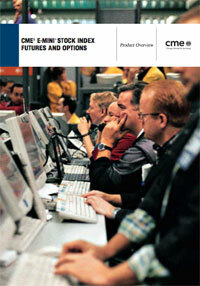 The Commodity Futures Trading Commission has many valuable resources on its website: www.cftc.gov. The website of the U.S. Federal Reserve has information valuable for any type of investor:www.federalreserve.gov. Many futures traders value futurebrokers.com for its simple futures brokers and futures trading platform comparison charts. The National Futures Association is a regulatory body of the futures industry, and is well worth a visit: www.nfa.futures.org. EliteTrader is a very popular discussion forum among futures traders: www.elitetrader.com.